This has been a while coming, folks. When Living Colour went their separate ways in 1995, we lost a truly unique and pioneering band. 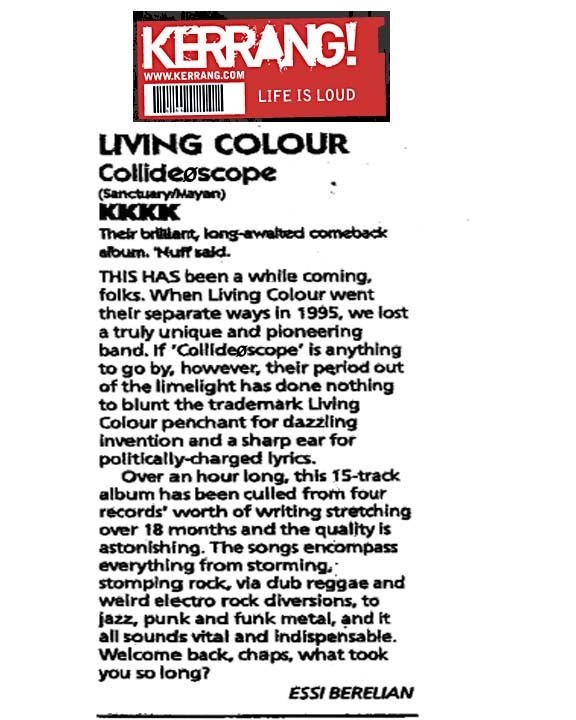 If 'Collideascope' is anything to go by, however, their period out of the limelight has done nothing to blunt the trademark Living Colour penchant for dazzling invention and sharp ear for politically-charged lyrics. Over an hour long, this 15-track album has been culled from four records worth of writing stretching over 18 months and the quality is astonishing. The songs encompass everything from storming, stomping rock, via dub reggae and weird electro rock diversions, to jazz, punk and funk metal, and it all sounds vital and indispensable. welcome back chaps, what took you so long!